The TPLF and Sudan Mutual Alliance! Leaders protect the safety and well being of their societies and build structures to that end, for now and for the future, while arsonists and treasonous individuals leave societies, a future infested with land mines and perpetual wars within and from without so that future generations should fight and clear and rebuilt what was destroyed. TPLF representing the later, is doing its highest acts of treason and intermittent arsonist, to the full effects of the words. Fomenting and ventilating ethnic, religious and any form of divisions of Ethiopians in order people loose cohesion and stay weaker to claim power, that is only possible through unity – this strategy worked to keep them in power to this day utilizing their own brute force of specialized armies of Tigrigna speaking people. We all heard representatives of the government from the nominal Oromo wing this week, because of the crackdown on protesters and the aftermath casualties, asking in their session, where these federal police and agazy army are from? They said, “they do not speak Amharic, they do not speak Oromigna but only Tigrigna “, although TPLF says, ethnic groups rule themselves, but only to pay taxes and obey rules to TPLF, and when it comes to problems of the kind seen last week, it is the job of TPLF only – no army of the locals has to be trusted and should not be treated as a friend but as would be potential danger and should be treated that way until order is established. The same thing we read a couple of weeks ago, that Gondar was infested by soldiers of only Tigrigna speaking people and the other local soldiers were forced in to hiding. This act is a direct reflection of what rule of people by others who think they do not belong to that society is but above them and that is exactly what TPLF does. The surprising thing is that there are people representing the Amhara, Oromo and other ethnic groups believing as coequals but treated as servants and second level members of the collation of the government in which TPLF is the sole super power in decision making process of consequential matters. Because of this repeated acts of betrayals and treason, the Ethiopian people should not listen and believe individuals who nominally talk in their languages and say they represent them in the TPLF government, but practically they only represent themselves for their pocket and living as people who sold their brothers and sisters for slavery just for penny – the recent events testify that. Giving comfort for neighboring countries in order to form a purpose driven comradelier relations of trust and political protection of their frontiers from potential opposition groups who might need temporary stay in respective countries and fight TPLF. This particular relation and comradelier is essential to directly order the detention of individuals in the respective countries that are suspected of dangerous political activities by the other governments or directly move in to their territories and capture the needed individuals in cooperation. This is not an easy ploy that normal governments do. 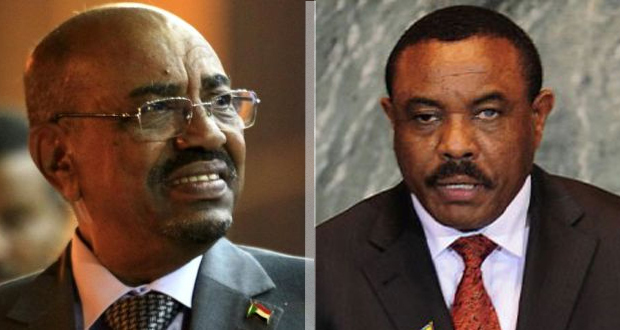 The reason why TPLF fanfares the demarcation of the boundary between Ethiopia and Sudan is motivated from both sides. Sudan thinks TPLF is the least Ethiopian in nature and non Ethiopian in desire and deeds to get what it wants. On the other side, TPLF thinks the boundary between Sudan and Ethiopia is a political liability and dangerous gateway next to Eritrea where opposition groups may use to wage wars against it and therefore a political strategy to save them, giving it to Sudan simply gives the needed protection by Sudanese and takes away that fear. Colonialism left meaningless decrees and decisions made unilaterally within their colonies and from without for neighboring countries. These political measures did not ask the consensus of all parties which were impacted by those decisions but only made by themselves for only for themselves from the zenith of dominance and power. Few such decisions from the many were the one regarding Abay (Blue Nile ), Ethiopia and Egypt. Great Britain occupied Egypt and Sudan as its colonies and during its rules, it put unilateral decrees that, any upper stream country where the waters of Nile are coming from, should consult Egypt before it makes any plan to utilize the river for its own developments. Fortunately this document was not signed by Ethiopia and even if it was signed, it will be found objectionable and unilaterally be nullified by Ethiopia and remained as a fallacious and wrong decree issued to keep their utilization at the expense of others. The stand of Egypt on this decree and its implementation was self contradictory and paradoxical, for otherwise it has remain the colony of Britain, if what an old decree of a colonizer is to be obeyed and respected for all time even after the colonizer left and fought to gain their independence from Britain. Second, Ethiopia, which was not a signatory of that document and which always stands against colonialism will never be obliged to accept such a political decision that not only represents and serves colonialism and directly hurts itself by not being able to utilize a natural resource of its own, to its developments and prosperity, just because someone of weapon said so. After decades of misunderstanding and at times faced off to wage wars against Ethiopia, Egypt today believes that the colonial decrees that gave Egypt complete ownership of Abay, Ethiopian natural resource by a colonial power was wrong and accepts that Ethiopia has a right to utilize its natural resources with legitimacy, which was not possible to do so in the times of Emperor Haile Selassie and Derg, that Ethiopia to establish several dams across the river to generate electric power for energy, one of the sources of developments but failed to do so by threats from previous Egyptian rulers. This was the very reason Egypt gave radio station to Idris Awate, an outright and socially declared cattle bandit from low land Eritrea to preach to start a concocted Eritrean war against Ethiopia that lead to the present state of suffering of the people from Eritrea. These problems however did not remain only between Egypt and Ethiopia but between Ethiopia and Sudan. Likewise Sudan was a colony of Britain and during that time, a single army officer simply wrote a letter to King Menelik regarding what the boundaries between their colony and Ethiopia should be and king Menelik rejected that proposal by saying that the proposal put several parts of Ethiopia in to British Sudan and that decision of King Menelik was kept valid during emperor Haile Selassie and Derg as well and nothing of anything happened since then. We heard Colonel Mengistu Haile Mariam, a person who lead Ethiopia for 17 years, saying recently that there was nothing of such kind of talk took place between Ethiopia and Sudan, instead perpetual quarrels and bickering took place between Sudan and Ethiopia as both sides were harboring opposing political groups of the other, and there was no such an agreement made during emperor Haile selassie either. The boundary between Ethiopia and Sudan are natural which is observed from space and delineated by their people who lived for millenniums and still live there. Ethiopians fought different invaders from that side of Sudan at different times and died and protected that part of the country for centuries, where they live and make a living is where Ethiopia stands. This boundary was attested by successive Ethiopian leaders, starting from emperors of Gondar, Fasiledes, Tewodros, Yohannes, Menelik, Hailselassies and Derg. Ethiopians should therefore be remain vigilant to oppose with any means at their disposal, the TPLF shenanigans and false but make belief stories that bends to give away Ethiopian territories to Sudan for the sheer purpose of what I mentioned above.